Los Angeles, CA – November 4, 2014 - Road & Travel Magazine (RTM) is proud to announce its top 5 finalists for the 2015 International Car of the Year (ICOTY). Listed alphabetically, they are the BMW i3; Hyundai Genesis; Kia K900; Kia Soul EV; and the Mazda Mazda6. 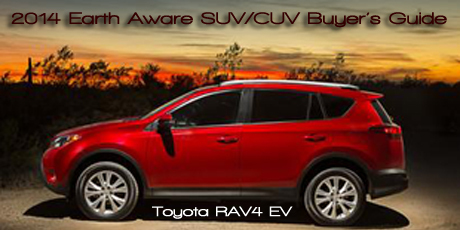 2014 Green SUV & CUV Buyer's Guide - Which Made Top 10? The year 2014 could be a fantastic or frustrating one for hypermiling crossover vehicle fans — those who specialize in wringing every possible bit of energy, and distance, from a vehicle fuel source. A tantalizing group of cutting edge, fuel-starving green SUVs and CUVs peeks out from the pages of glossy automotive magazines. They leap off the fluid screens of internet blog sites. They highlight conversations of tree hugging enthusiasts over their water filtering bottles as they travel, with tender footsteps, across fields, ford streams, climb rocks and breathe in the essence of the clean air they are determined to protect. Those futuristic vehicles—that might have made the Jetsons green with envy—hint at the extraordinary research, development, and cost, from car companies trying to find new, previously unimaginable ways to cut the energy footprint of getting from here to there. Combined with the promise of an ecologically sound means of transport, they seem to be the perfect answer for an increasingly clogged environment that conservationists avow desperately needs cleaner, less earth sullying vehicles. These trendy, coveted and ultimately usable people haulers seem to have it all — the perfect size and shape for a number of travel needs from hauling some goods to carrying a small group of people to subbing as a mobile office or at times a service vehicle, such as a green taxi. 2014 Earth, Wind & Power "Most Earth Aware Car of the Year"
As we watched a profusion of college students jog, skate, bicycle and schmooze their way past our Minneapolis hotel, we realized we were in for an education on what is important to those on the cusp of an environmentally challenging world. They were the kind, in their early 20s to maybe mid-30s it seemed, in plaid sneakers, cutoffs in cold weather and eyes glued to a smart phone screen. Just the type, we thought, who would be woed and won by a point-in-life auto like the resoundingly revised 2014 Toyota Corolla. We had come to the largest of Minnesota's Twin Cities to find out why Toyota considered its revised compact car so important as the automaker kicked off the 11th generation of this staple. 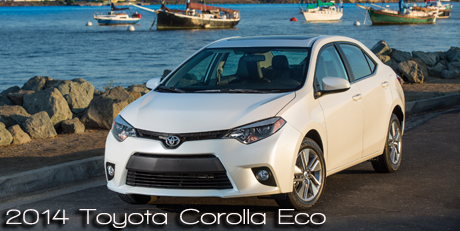 After all, the Corolla has dominated the world of compact autos in all corners of the globe for decades. It virtually launched the small car industry in the U.S. when seeming block-long domestic gas guzzlers dominated American roads. And it has spawned a wealth of imitators seeking to dethrone it from its lofty perch ever since. It didn't take long to realize that not only was the Corolla a breath of fresh air visually, but in driving credentials as well. But it also pointed out how the auto is aiding in preserving the fresh air we breathe and protecting our planet by diminishing the factors that add pollutants to the atmosphere. And its achievement of reaching a lofty 40 miles per gallon mileage with an internal combustion engine heart rather than with a highly sophisticated and costly hybrid, clean diesel or more elaborate technology tells us there really still is life in yesterday's engine type when it's tamed and tweaked to accommodate tomorrow’s vehicles. With those gold star elements plus pricing that has not gone ballistic, it didn't take long to determine the 2014 Corolla was an uncompromising champion to be recognized. And so, it was name Earth, Wind & Power’s Most Earth Aware Car of the Year for 2014. 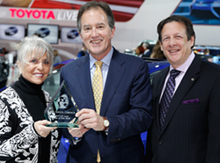 Presenting the 2014 Most Earth Aware Car of the Year award to Bill Fay, Group VP & GM Toyota Division U.S., are Courtney Caldwell, editor, Road & Travel Magazine; and Mike Martini, president Bridgestone OE Americas, and EWP award sponsor. We were smitten at first sight of the sassy, sporty 2014 Audi turbo-diesel when it showed up at our doorstep. Our test model was Glacier White Metallic and sported a large "TDI" on each front door for a sophisticated, no-nonsense announcement of its capabilities. So much for not blowing one's own horn. A flared front end with sultry headlamp "eyes," anchored by those famed four interlocking grille hoops sniffing down the road balances the trim tush in the rear and announces in no uncertain terms this is a coveted Audi. For those who need to transport five in luxurious comfort, the Q5 could be an ideal choice. The priciest of the fuel conscious versions (which seems like a no-brainer) is the hybrid Q5 that uses a 2.0-liter 245-horsepower inline four engine paired with an electric motor for a combined 245-horsepower and 254-lb. ft. of torque. It clocks in with a $51,300 base price, earning EPA ratings of 24 city/30 highway miles. Those high ticket items point out what every wannabe Audi owner certainly knows—that no matter how environmentally conscious one might be in choosing a vehicle, when you're paying premium prices you expect to get premium perks out of the deal. So what can the Q5 offer in the way of amenities, both in driving manners and the way it strokes the owner on the upmarket side? Once inside, besides keyless start, there's leather (luscious Milano leather when fitted with comfort seats), aluminum and all-natural walnut trim and a heated/cooled cup holder to ensure drinks are kept at optimal temperature. Driving at night is a kick even if the only reason is to see the glow of red from all those buttons and controls that jump to life when activated. The hybrid version gets Audi's Bang & Olufsen 505-watt premium Sound System with 14 speakers as standard equipment. "Audi connect" can mate with as many as eight wireless devices at one time. And the TDI gets something that's becoming a vanishing breed in many vehicles as precious interior space is diverted for heavy battery storage and a bit more cargo space. That's an actual compact space saver spare tire, designed for temporary use. A Q5 biggie is "quattro" drive on all versions. That's Audi talk for its permanent all-wheel-drive system, and a clear indication this is a go almost anywhere vehicle when driving conditions get tough, such as during a Northern midwinter blizzard or blazing through pools of water on rain slicked roads. All Q5 power plants mate to an eight-speed Tiptronic automatic for smooth, supple handling and a stingier need for fuel in the process. We can attest to the punch the diesel fuel-drinking TDI can deliver when rubber meets the road. It rates at an even feistier 0 to 60 in 6.5 seconds. 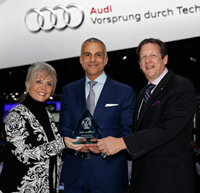 Presenting the 2014 Most Earth Aware SUV of the Year award to Mark Del Rosso, EVP & COO, Audi America, are Courtney Caldwell, editor, Road & Travel Magazine; and Mike Martini, president Bridgestone OE Americas, and EWP award sponsor. “We are honored to accept the Earth, Wind & Power Award for Most Earth Aware SUV of the year, which recognizes the environmental friendliness and fuel economy of the Audi Q5.” said Del Rosso. Not long ago, the idea of a plug-in electric car was enough to raise lots of eyebrows. Quips circulated about a bubble-shaped car dragging an orange extension charging cord behind it like the tail of a cat, or sitting in the middle of a freeway when the AA batteries ran dry. Of course the batteries that power an electric car, or a gas-electric hybrid car for that matter, are light years beyond those that set a flashlight aglow. But the idea behind it isn't futuristic at all. With tragedies such as Hurricane Sandy and this winter's severe snow storms in our rear view mirrors, the idea of climate change has taken on an urgency not seen in the past. And while auto companies already had gotten on the bandwagon in developing earth friendlier vehicles that could scoff at trips to the gas station or get their power from distant plants or wind farms away from urban areas, there's nothing like immediacy to get someone's attention. Look around you as you drive, and you're likely to see fuel conserving vehicles in the next lane, or down the block. To see RTM's Top 10 Picks, click here.